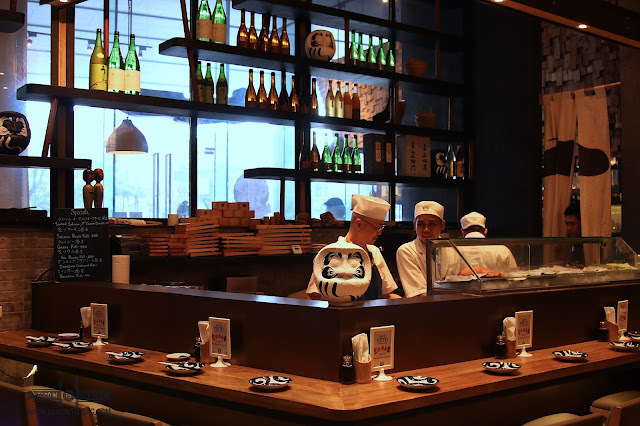 With more and more Japanese Restaurants opening left and right, it seems that authenticity has declined. Some restaurants tend to have a more dominant sweet Filipino flavor in their Japanese dishes just to cater to its market. Thankfully IZAKAYA SENSU in BGC has decided to put it in the middle. 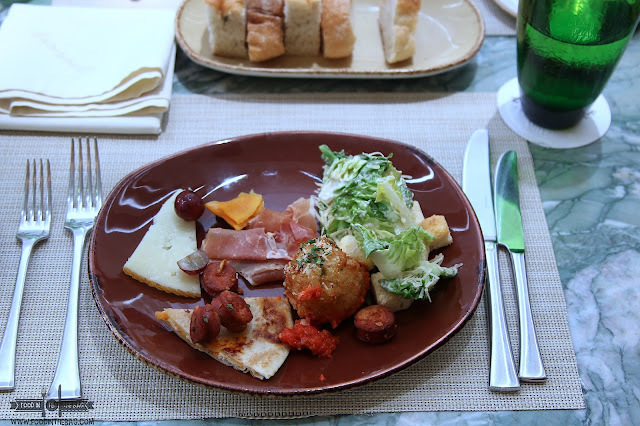 Without sacrificing too much, a balance is achieved with each dish they serve. As you enter the restaurant, you are greeted by a small sushi bar. 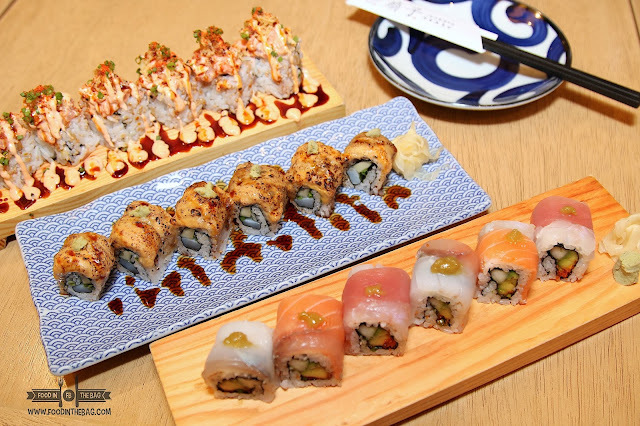 Here, different rolls and sashimi are prepared fresh for everyone by their master Japanese chef. 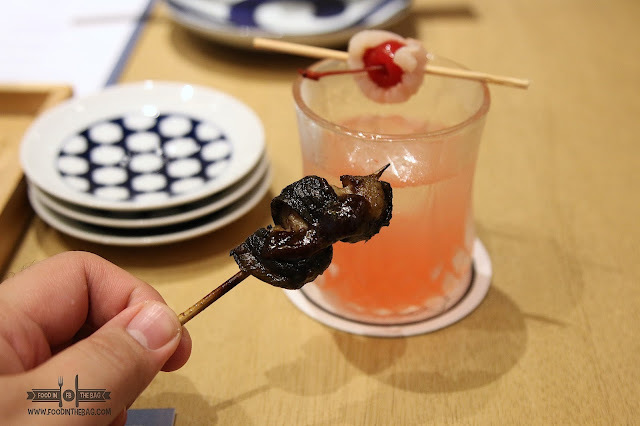 Drinks are also a must as IZAKAYA SENSU is the other half of CHOTTO MATTE. 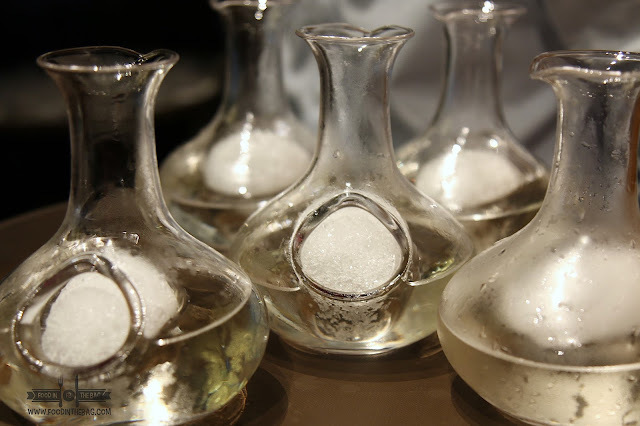 Known for their Japanese cocktails, their SAKE offerings are no different either. The ASIAN BEAUTY is great way to start a meal. Very smooth and aromatic, the sake has one of the highest grade. The rice used was 50% polished so the extracts are right there where you would want them. New dishes were prepared for their JULY LAUNCH. There was a set of rolls that were created to make use of the fresh ingredients. The first thing that would catch your attention would be the colorful RAINBOW ROLL. A mix of blue fin tuna, salmon, white meat fish, and horse mackarel, variety is the name of the game. Another variety that would interest you would be the ABURI UNI and IKA. Sea urchin is mixed with squid and a number of garnish are torched to create a creamy outer layer. The ika or squid might be a little slimy at first but the texture compliments the entire dish. 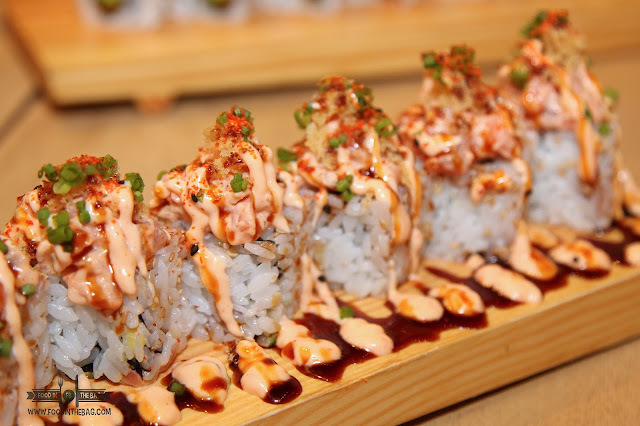 If there was only one roll to pick, it would have to be the dynamite roll. Salmon and blue fin tuna are mixed with chili powder and tempura flakes. This gave it a bit of crunch and punch. Surprisingly, IZAKAYA SENSU has brought out a couple of soup dish that are cooked table side. 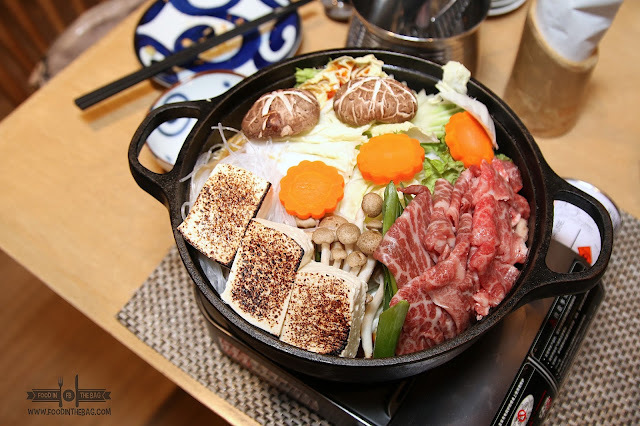 The first would be the "CHAN CHAN" NABE - SHAKE MISO. 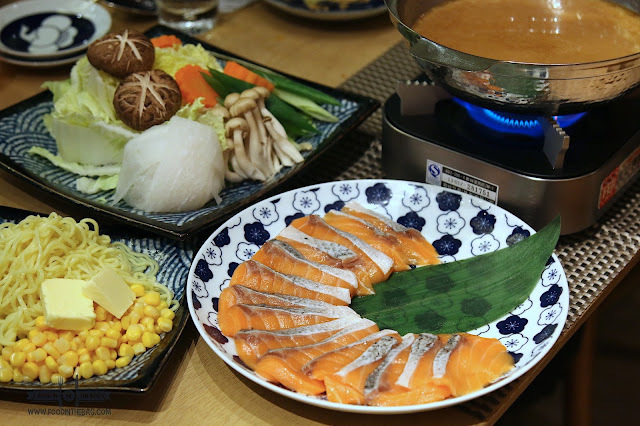 It's a shabu-shabu that uses Norwegian Salmon. Fresh vegetables helps flavor the broth. From here, one should dip the salmon for less than a minute to produce perfection. The liquid in itself is a bit salty but with go well with the accompanying noodles. It actually makes sense to have this with rice. 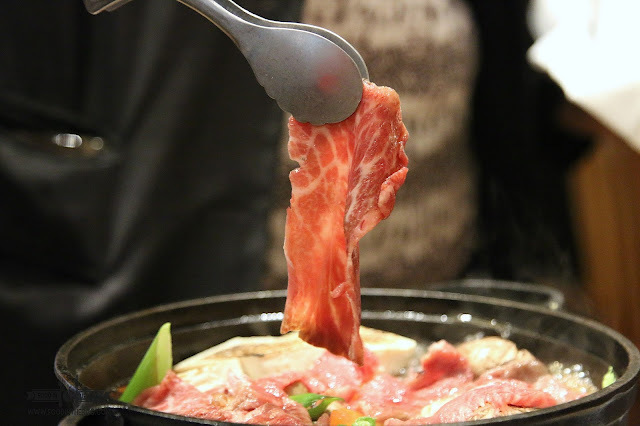 For meat lovers, the WAGYU SUKI-YAKI would be perfect. 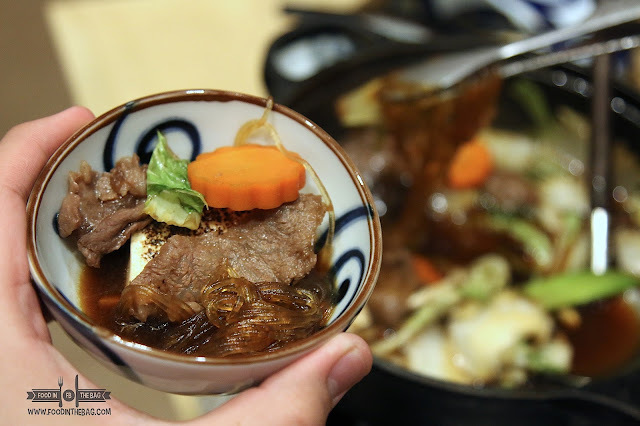 Delicately sliced wagyu and other fresh ingredients are mixed in a sweet Japanese soy sauce broth. The meat in itself has great marbling and could be cooked in less than a minute. After such, drown it in the provided freshly cracked egg. This in turn, adds sweetness and brings out the flavor of the meat really well. Dessert is very similar to a green tea parfait. Having different toppings, the ANMITSU is a refreshing end to a heavy meal. 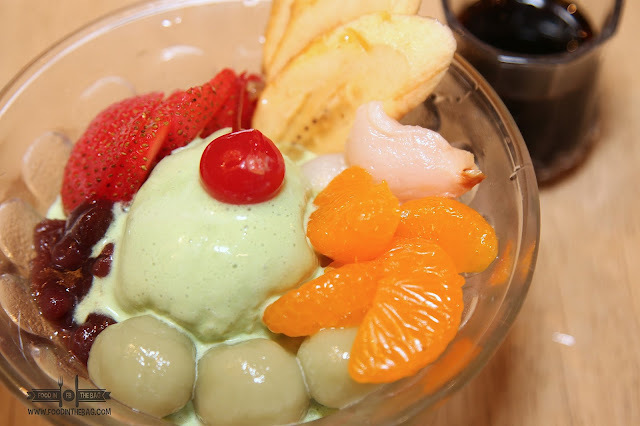 With red beans, fruits, and even mochi balls, you won't go wrong with having this spoonful after spoonful. Aside from these new dishes, happy hour occurs everyday. Guests are able to try out more drinks as they offer buy one take one on selected cocktails. Note: Valet Parking is available at the basement. Entrance after 5pm is at 80Php Flat Rate. Otherwise, it's 80Php for the first two hours then 50 Php per hour thereafter.